On the video commentary on Greatest Video Hits 2, Roger Taylor makes it clear that he hates the music video for the song “Back Chat”. If you think about, or just continue reading, Roger hates a lot of their videos. This one, “Calling All Girls”, “It’s a Hard Life”, and most likely more. "Action This Day" takes its title from a Winston Churchill catchphrase that the statesman would attach to urgent documents, and recapitulates the theme of social awareness that Taylor espoused in many of his songs. Michael Jackson, who was close friends with the band during the time, later cited Hot Space as a building block for his own blockbuster album Thriller. 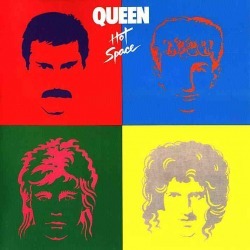 The inspiration for the Hot Space album cover, came from The Beatles’ album Let it Be.